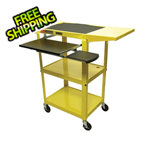 The AVJ42KBDL from Luxor is a versatile metal cart that offers flexible features in a sturdy design. 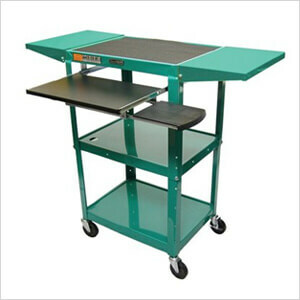 The cart has 4 rolling casters for easy mobility and an adjustable height of 24-42". The cart has cable pass-thru holes, a 3-outlet electrical unit, a 1/4" retaining lip around each shelf, and a safety mat on the top shelf. 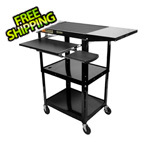 It also includes a small tray, ideal for supporting a keyboard (mouse shelf not included).